These Chicken and buckwheat patties are a meal in themselves - loaded with grains, protein and even greens! It's glorious if you can get your kids to eat them and our son did which made my heart go pitter-pat. He enjoyed these dipped in ranch. My Mama-in-law shared this recipe with us. I love how she gets so creative in the kitchen. These are quite a healthy treat! Cut broccoli into florets and pulse in a food processor until finely chopped then transfer to a large mixing bowl. Chop and saute spinach on a hot skillet with 1 Tbsp oil for few minutes or just until soft, then add to the same mixing bowl. In the bowl of a food processor (or using a meat grinder), grind together buckwheat and chicken breasts then transfer to the mixing bowl. Finely dice/mince onion (a food processor makes it easy) and add to the mixing bowl. Finally, add 1/4 cup panko bread crumbs, 1 egg, 1 Tbsp of Sour Cream or Mayo. Season with salt and pepper to taste (we used 1/2 tsp salt, 1/4 tsp pepper) then thoroughly mix until combined. 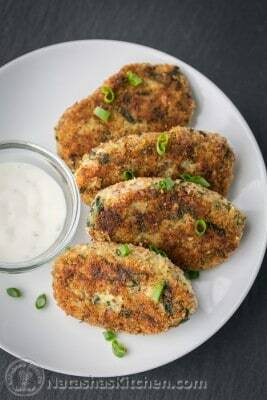 Form oval patties, dip them on both sides in Italian bread crumbs and cook on a well-oiled skillet over medium heat, flipping 4-5 times during the process until cooked through.